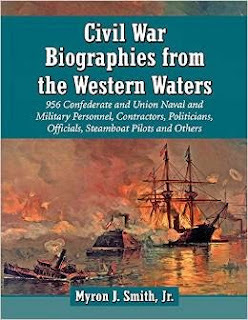 Smith: "CIVIL WAR BIOGRAPHIES FROM THE WESTERN WATERS: 956 Confederate and Union Naval and Military Personnel, Contractors, Politicians, Officials, Steamboat Pilots and Others"
Over a relatively brief period with the publication in rapid succession of Le Roy Fitch: The Civil War Career of a Union River Gunboat Commander (2007), The Timberclads in the Civil War: The Lexington, Conestoga, and Tyler on the Western Waters (2008), Tinclads in the Civil War: Union Light-Draught Gunboat Operations on Western Waters, 1862-1865 (2009), The USS Carondelet: A Civil War Ironclad on Western Waters (2010), The CSS Arkansas: A Confederate Ironclad on the Western Waters (2011), and The Fight for the Yazoo, August 1862-July 1864: Swamps, Forts and Fleets on Vicksburg's Northern Flank (2012), Myron Smith has made a one of a kind collective contribution to the Civil War naval literature. Discursive in a good way, the core narratives and fascinating side trips contained in these deeply researched tomes together offer a picture unmatched in depth of the full range of campaigns conducted on western theater waterways. Never overlooking the human and industrial underpinnings of the whole enterprise, the books profile extensively the men and machines that were central to it all. Equally useful, the author's new book Civil War Biographies from the Western Waters is a natural product of these earlier works and the decades of research that went into them. The book's biographical sketches of 956 Union and Confederate military and civilian figures comprise no casual undertaking. With "naval officers down to the rank of mate; enlisted sailors who won the Medal of Honor, or otherwise distinguished themselves or who wrote accounts of life on the gunboats; army officers and leaders who played a direct role in combat along Western waters; political officials who influenced river operations; civilian steamboat captains and pilots who participated in wartime logistics; and civilian contractors directly involved, including shipbuilders, dam builders, naval constructors and munitions experts," criteria for inclusion in the register is remarkably broad. It's not just a collection of well known individuals with a small number of obscurities thrown in for good measure, far from it. Even veteran readers will likely find one or more virtual unknowns on most pages. The treatments are significant. Length varies due to source availability, of course, but the average capsule biography in the book runs around 300 words or so and includes (where applicable) name, rank, vessel affiliations, occupation, dates of birth and death, summary of war service, and also known information about the subject's prewar and postwar activities. The source list at the bottom of each entry indicates use of both archival and published materials. In addition to providing a traditional index, Smith also offers in a series of appendices additional tools for cross-indexing his biographical subjects with Union and Confederate service branches; campaigns, battles and engagements; and ship registers. The positive traits are overwhelming but one thing that might disappoint readers is the book's rather limited photographic coverage. With its learned gathering of almost one thousand Civil War historical figures associated with western theater naval warfare (many of these featured in print for the first time), Civil War Biographies from the Western Waters is a unique and valuable reference guide for libraries and serious students. Another solid review and this looks like another winner from Smith. Any idea why he hasn't been able (apparently) to line up another publisher for any of these - say, one of the academic presses? His work is consistently solid, which is a random occurrence at McFarland from what I can tell. I don't know for certain but I would hypothesize that he went with McFarland because they allowed him free reign to do it his way. An academic publisher, for instance, in order to convert Smith's oversize format and small font to their own trim size and font preferences would probably need to treble already prodigious page lengths. I am sure they would have required massive cutting before even considering his books for publication. Good points - that's what I was thinking might be the case. And that's the problem with McFarland - the author files the plane. If the author is somebody like Smith, it's a smooth flight but all too often it's obvious that somebody with a couple of hours of classroom training climbed into the cockpit. "Uniforms of the Civil War"